The 2005 was a good year for Apple. The iPod gave an enormous lift to the company’s financial results. Thus in the quarter ending March 26, 2005, Apple earned US$290 million, or 34¢ a share, on sales of US$3.24 billion. Apple sold its 300 millionth song on March 2, 2005. On July 17, 2005, the iTunes Music Store sold its 500 millionth song. At that point, songs were selling at an accelerating annualized rate of more than 500 million.On April 29, 2005, Apple released Mac OS X v10.4 “Tiger” to the general public. As of the week of October 24, 2005 Apple released the Power Mac G5 Dual that featured a Dual-Core processor. This processor contains two cores in one rather than have two separate processors. Apple has also developed the Power Mac G5 Quad with two of the Dual-Core processors for enhanced workstation power and performance. The new Power Mac G5 Dual cores run individually at 2.0 GHz or 2.3 GHz. The Power Mac G5 Quad cores run at 2.5 GHz and all variations have a graphics processor that has 256-bit memory bandwidth. 4 January, 2005: Apple announces it has begun shipping Xsan, a high performance, enterprise class Storage Area Network (SAN) file system. The price announces is of $999 per client and per server. 4 January, 2005: Apple upgrades Xserve G5. January 6, 2005: The Eurozone version of iTunes Music Store arrives at the Republic of Ireland, where it could not open earlier due to the intransigence of the Irish Recorded Musis Association (IRMA). January 10, 2005: In San Francisco, California, the Macworld Conference and Expo trade show is held, over five days. January 11, 2005: At the Macworld Expo in San Francisco, Apple Computer introduces the Mac mini computer. It features 1.25 GHz G4 processor, 40 GB hard drive, 256 MB RAM, 32 MB ATI Radeon 9200 graphics, 512 kB L2 cache, two USB 2.0 ports, FireWire 400 port, 10/100BaseT Ethernet, AirPort, DVD-ROM/CD-RW drive, optional AirPort Extreme and Bluetooth. Size is 6.5 x 6.5 x 2 inches; weight is 2.9 pounds. Price is US$499 with no keyboard, mouse, or display. Another model has 1.42 GHz processor and 80 GB hard drive, for US$599. January 11, 2005: Apple introduces iPod shuffle, iLife ’05, iWork ’05, Final Cut Express HD. At the same time, Apple and leading car companies team up to deliver iPod integration in 2005, and Apple & Mercedes-Benz unveil iPod integration kit.Apple and Volvo announce iPod connectivity for entire 2005 on US model line. January 22, 2005: Apple Computer ships the iWork software. Apple Computer ships the Mac mini computer. January 24, 2005: iTunes Music store downloads top a quarter billion songs. January 31, 2005: Apple releases new and more powerful, faster and more affordable PowerBook G4 portable computers in the USA and United Kingdom. They feature 1.5 or 1.67 GHz G4 processor, 512 MB RAM, 12.1- or 17- inch LCD, AirPort, 512 KB L2 cache, 64 MB NVidia GeForceFX 5200 or 128 MB ATI Radeon 9700 graphics, two USB 2.0 ports, FireWire 400, FireWire 800, Ethernet, DVD-ROM/CD-RW or DVD-R drive, 80 or 100 GB hard drive. Prices are US$1499-2699 in the USA, and 1049-1849 pounds in the UK. February 2005: Apple opens stores in Japan: Nagoya, the Shibuya district of Tokyo, Fukuoka, and Sendai. February 23, 2005: Apple updates iPod photo lineup. February 23, 2005: Apple unveils new iPod mini starting at just $199. March 2005: An Apple store in the Bullring shopping centre in Birmingham opens. March 2, 2005: Apple announces that iTunes Music store downloads have surpassed 300 Million. That means that Apple iTunes Music Store sells its 300 millionth song. March 10, 2005: Blu-ray Disc Association welcomes Apple to its board of directors. 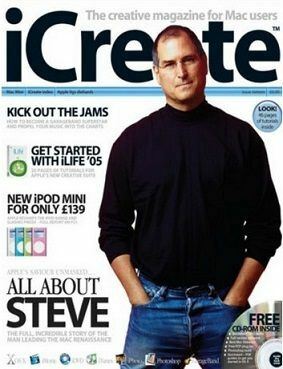 March 29, 2005: In the first quarter of the year, Apple earned US$290 million, or 34¢ a share, on sales of US$3.24 billion. April 17, 2005: Apple unveils Final Cut Studio, introduces Soundtrack Pro and announces Shake 4. Apple Continues to Lead the Industry in the Adoption of HD Video at NAB. April 27, 2005: Apple Computer releases updated Power Mac G5 systems. They feature single or dual processors operating at 2 to 2.7 GHz. Starting prices range from US$1499 to US$2999. April 28, 2005: Apple reduces prices on Cinema Display. April 29, 2005: Apple Computer releases Mac OS X 10.4 operating system. New features include Spotlight search, Dashboard with 14 mini-apps, 64-bit memory addressing, iChat, QuickTime 7. Price is US$129 for single user, or US$199 for a five-user license. Price in the UK is 89 pounds. Code-name during development was Tiger. May 2, 2005: Apple announces that it will supply iBooks for Cobb County One-to-One computer learning initiative. May 3, 2005: Apple unveils new iMac G5 line which delivers faster performance, built-in wireless & Mac OS X “Tiger”. May 10, 2005: iTunes Music Store Launches in Denmark, Norway, Sweden & Switzerland. May 16, 2005: Apple computer releases Mac OS X 10.4.1. May 20, 2005: Apple Announce Recall of iBook and PowerBook Computer Batteries. June 2005: Apple Computer discontinues single-processor Power Mac G5 systems. June 2, 2006: European iTunes Music stores now accept Firstgate’s Click & Buy. June 3, 2006: Apple Announces free iPod recycling program at US retail stores. June 6, 2005: In San Francisco, California, Apple announces it is the PowerPC processor in favor of Intel processors for Macintosh computers. The first Intel-based Macintosh computers should be on the market by mid-2006, with PowerPC-based computers phased out by the end of 2007. Reasons given for the switch are the lack of a 3 GHz G5 processor, lack of G5 processors for portable computers, and the Intel processor future looks better for Apple computers. On the same occasion Apple announces that it will deliver 2 millionth copy of Mac OS X Tiger this week. Apple also unveils preview release of QuickTime 7 for Windows. In a keynote address Steve Jobs confirms rumors that the company had secretly been producing versions of its current operating system Mac OS X for both PowerPC and Intel processors over the past 5 years. Rumors of cross-platform compatibility had been spurred by the fact that Mac OS X is based on OpenStep, an operating system that was available for many platforms. In fact, Apple’s own Darwin, the open source underpinnings of Mac OS X, was also available for Intel’s x86 architecture. June 23, 2005: European iTunes Music store tops 50 million songs in first year. June 27, 2005: Apple releases three updated iMac G5 computers: 17-inch display 1.8 GHz processor for US$1299; 17-inch display 2 GHz processor for US$1499; 20-inch display 2 GHz processor for US$1799. June 27, 2005: Apple releases two updated eMac G4 computers, with 1.42 GHz G4 processor. Prices are US$799 and US$999. June 28, 2005: Apple Merges iPod & iPod photo Lines. June 30, 2005: iTunes Podcast subscriptions top one million in first two days. July 2005: Apple opens an Apple store at Bluewater shopping centre in Dartford, Kent. July 2005: Apple opens its first store in Canada at the Yorkdale Shopping Centre in North York, Toronto. July 12, 2005: Apple releases Mac OS X 10.4.2 operating system. July 18, 2005: iTunes Music store downloads top half a billion songs. At that point, songs were selling at an accelerating annualized rate of more than 500 million. July 26, 2005: Apple Computer enhances Mac Mini with double the memory across the line. A version with 1.25 GHz PowerPC G4 processor is priced at US$499. A version with 1.42 GHz PowerPC G4 processor and AirPort Extreme and Bluetooth is priced at US$599. A similar model with SuperDrive (CD/DVD burner) is priced at US$699. July 26, 2005: Apple Computer releases updated faster iBook portable computers. Common features include a scrolling TrackPad, sudden-motion sensor, 512 MB RAM, AirPort Extreme Wi-Fi networking, Bluetooth 2.0 wireless connectivity. The iBook with 12-inch screen and 1.33 GHz PowerPC G4 costs US$999. The model with 14-inch screen and 1.42 GHz processor is US$1,299. 27 July, 2005: Apple iBooks enhance learning in Broward County public schools. August 2, 2005: Apple Computer releases the Mighty Mouse for Macintosh computers, with 360-degree scroll ball and four programmable buttons. Price is US$49. This is the first multi-button mouse for Apple in 21 years. August 4, 1005: Apple launches iTunes Music store in Shibuya, Japan. August, 8, 2005: Japan iTunes Music store sells one million songs in first four days. September 2005: Apple opens the Meadowhall Store in Sheffield and the Trafford Centre Store in Manchester (UK). September 2005: Market share of personal computers worldwide during July to September: Dell 18%, Hewlett-Packard 16%, Lenovo 7.7%, Acer 4.7%, Apple Computer 2.3%. Market share of personal computers in the US during July to September: Gateway 6.4%, Apple Computer 4.3. September 2005: Apple iTunes Music store is number one in the UK with 80 percent market share. September 7, 2005: Apple Introduces iPod nano. Apple Introduces iTunes 5. Apple, Motorola & Cingular Launch World’s First Mobile Phone with iTunes. Apple announces that over 1,000 accessories are now available for iPod. September 7, 2005: Apple teams up With Acura, Audi, Honda & Volkswagen to deliver seamless iPod experience to the public. September 13, 20065: Apple updates Xserve RAID storage system, a 3U high-availability, rack storage system to deliver a massive 7 terabytes (TB) of storage capacity at the price of $1.86 per GB. Apple also upgrades its Xserve 1U rack optimized server with up to three 500GB drives, achieving a groundbreaking 1.5TB of storage. Prices for Xserve start at $2,999 and prices for Xserve RAID at $5,999. September 14, 2005: Coldplay, Capitol Records and Apple release Fix You, a digital EP that includes two songs previously unreleased in the US— “Pour Me” and “The World Turned Upside Down”—in addition to two versions of “Fix You,” the band’s new single from the double Platinum album X&Y. The EP is available exclusively on the iTunes® Music Store in the US. Coldplay, BMG Publishing, Capitol Records/EMI and Apple announce that they will donate 100 percent of their share of the proceeds of all US sales of this digital EP to the American Red Cross Hurricane 2005 Relief and the National Academy of Recording Arts & Sciences’ MusiCares Hurricane Relief Fund. The Fix You EP was planned for digital release in the US later, and in the wake of Hurricane Katrina, Coldplay, Capitol and Apple moved up the release date. September 20, 2005: Apple introduces major enhancements to .Mac. October 2005: Apple Computer releases an updated PowerBook G4 computer. It features 17-inch display, and 1.67 GHz G4 processor. Price is US$2499. Price for a 15-inch display is US$1999. October 12, 2005: Apple Computer announces an updated iMac G5 computer. It features 20-inch wide-screen LCD, iSight camera, multibutton mouse, 2.1 GHz PowerPC G5 processor, 512 MB RAM, 250 GB hard drive, ATI Radeon X600 XT graphics, dual-layer DVD+/-RW drive, Max OS X 10.4. Price is US$1699. Price for a version with 17-inch screen and 1.9 GHz processor is US$1299. October 12, 2005: Apple unveils the New iPod. Apple announces iTunes 6 with 2,000 music videos, Pixar short films & Hit TV shows. October 14, 2005: Tim Cook is named COO of Apple. October 19, 2005: Apple Introduces Aperture. October 19, 2005: Apple enhances PowerBooks with higher-resolution displays and longer battery life. October 19, 2005: Apple Computer announces a new Power Mac featuring a dual-core 2.0 GHz PowerPC G5 processor, 512 MB RAM, 160 GB hard drive, Nvidia GeForce 6600 LE video card with 128 MB video RAM, three PCI Express expansion slots, 16x SuperDrive with double-layer support, FireWire 800 port, two FireWire 400 ports, four USB 2.0 ports, two USB 1.1 ports, optical and digital audio input and output, and 802.11g Wi-Fi and Bluetooth 2.0 support. Price is US$1,999. October 19, 2005: Apple Computer announces a new Power Mac featuring a dual-core 2.3 GHz PowerPC G5 processor, 512 MB RAM, 250 GB hard drive, Nvidia GeForce 6600 LE video card with 256 MB video RAM, three PCI Express expansion slots, 16x SuperDrive with double-layer support, FireWire 800 port, two FireWire 400 ports, four USB 2.0 ports, two USB 1.1 ports, optical and digital audio input and output, and 802.11g Wi-Fi and Bluetooth 2.0 support. Price is US$2,499. October 19, 2005: Apple Computer announces the Power Mac G5 Quad computer. It features two dual-core 2.5 GHz PowerPC G5 processor, 512 MB RAM, 250 GB hard drive, Nvidia GeForce 6600 LE video card with 256 MB video RAM, three PCI Express expansion slots, 16x SuperDrive with double-layer support, FireWire 800 port, two FireWire 400 ports, four USB 2.0 ports, two USB 1.1 ports, optical and digital audio input and output, and 802.11g Wi-Fi and Bluetooth 2.0 support. Price is US$3,299, available in November, 2005. October 25, 2005: Apple launches iTunes Music store in Australia. Apple was selling songs for A$1.69 each, albums at A$16.99 (generally) and music videos and Pixar short films at A$3.39. Briefly, people in New Zealand were able to buy music off the Australian store. However, that loophole was quickly closed. October 31, 2005: Apple Computer releases the Mac OS X 10.4.3 software for the Macintosh. October 31, 2005: iTunes Music store sells one million videos in less than 20 days. November 16, 2005: Apple announces that iPod & iTunes Music store are both number one in Japan. 21 November, 2005: Apple announces long-term supply Agreements for flash memory. December 6, 2005: NBC Universal & Apple offer new primetime, cable, late-night & classic TV shows on the iTunes Music store. To save money for new Apple models, trade in your used devices at iGotOffer for top dollar. Free instant quote, free fully insured shipping and fast secure payment: Sell my old electronics online.